1 How to cook millet porridge? 2 How to cook millet porridge? 3 How to cook millet porridge in multivarka? 4 How to cook millet porridge in the microwave? Modern people are quite unfairly deprive attention is tasty and healthy dish, like millet porridge. Millet on the content of nutrients and vitamins exceeds the figure, wheat, corn, barley and other grains. It contains protein, phosphorus, folic acid, zinc, potassium, magnesium, sodium, iodine, bromine, vitamins A, AT, With many other micro-- and macro, needed by the body for normal operation. Understand, how to cook millet porridge is not difficult, than all other cereals from cereals, but there are some nuances. First of all, you need to decide, porridge some consistency is needed. You can cook crumbly pshonku, when the water in the finished porridge will not do. This will require 100 g millet and 200 ml of water. Other options - a viscous liquid or millet porridge, when 100 g spent grains 350 or 600 ml liquid respectively. But everyone can adjust these proportions for themselves: more water, the more liquid will porridge. Before cooking should be cleaned from the husk of the seeds and waste oils. You can pour the millet with cold water in the tank and all, rise to the surface, simply merge. Such actions must be repeated several times. Refined wheat is placed in a pot, It is filled with cold water. Next, you need to wait, when the water boils away approximately half of its volume (can be determined "by eye"). When the millet will begin to swell, fire off, the remaining water is drained, Next you need to remember, how to cook millet porridge already without it. Heat the milk poured into the cooking porridge. When the barley has absorbed all the liquid, mash ready. It is necessary to remove from the fire at this moment, otherwise it will immediately begin to burn. 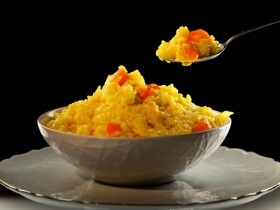 The porridge can be added to taste jam, prunes, pumpkin, various fruits. The average cooking time pshonnoy porridge - 20-25 minutes. But it depends on the number of products and on the desired future of porridge consistency, as well as several other factors. You can reduce the cooking time, if the grain pan to preheat or boiling water pour already. You can zaparivat grains overnight in a thermos. How to cook millet porridge in multivarka? Very useful to get millet porridge, cooked in multivarka. To do this rinse grain in the manner described previously, Put all the ingredients (corn, water, cream, salt, sugar) in appropriate containers Multivarki and selected in accordance with the instruction desired mode. Usually cooking porridge in this way takes 1 time. Further the products are added oil and minutes 15 porridge must ripen. 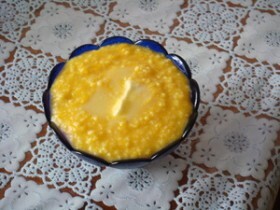 How to cook millet porridge in the microwave? 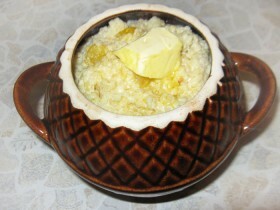 There are recipes that, cooking porridge like millet may also be in the microwave. In a large bowl filled with water washed grain and cooked at full power for about six minutes,. Then the water is drained, instead it is added to milk. cook more 2 minutes, carefully watching, so that the milk does not run away. Next, another 3 minute capacity of the furnace is reduced. Thereafter pshonnoy porridge need to stand for ten minutes in a sealed container. And it can bring to the table. It is worth noting, millet gruel that need to be used immediately after preparation, tk. during the cooling and subsequent warming up it loses its flavor.